Ukraine: Lost in the Globalized Shuffle? I have read quite a bit about the Ukraine situation over the past week and find it difficult to sort out. It is not quite an international crisis (that word overused to the point of a yawn), but it has great potential to become one. Of course, so does Syria, which remains a “problem from hell,” but Syria does not pit the U. S. vs. Russian interests as directly. Yes they are on opposite sides of the Syrian struggle, but as reported in the Los Angeles Times yesterday, they have worked together to remove an estimated 90% of the worst chemical weapons in Syria, a fairly amazing achievement in the midst of a civil war. That is the kind of news that doesn’t get much coverage. As you know, the news most covered is almost always bad. The good news has to be very good to draw the spotlight (*1). Also, there is another aspect to this good news that undercuts its goodness. In making this deal with Putin and Assad, Obama was acceding to Assad remaining in power for months to accomplish the task, deflating those rebels (some of the many) we have supported somewhat. That is the ugly underside of “realpolitik” boys and girls. Leaving news coverage aside, the simple lesson to be learned from the removal of Syrian chemical weapons is this: Russia and the United States can work together, even now, when our governments see a mutual interest. What gives Ukraine such potential for a crisis is that Washington and Moscow have not established a clear path that will satisfy their mutual interests. We and our allies would like to see a stable Ukraine developed (which would likely favor the West), while an unstable Ukraine afraid to get too close to the West works in favor of Putin’s Russia. If he can not have Ukraine as an ally, the weaker it is the better he likes it. Not to mention that the present day focus on eastern Ukraine has made the Russian gobble up of Crimea yesterday’s news (*2). It is a fait accompli and we have all moved on to other issues. I mention “Putin’s Russia,” while generalizing who is in charge of “our Western” efforts, because in Russia so much of the power seems centralized in that one man, with his revival of nationalist pride backed by an often reported 80% in public opinion polls. Power in the West is much more decentralized, at least when it comes to economic power and in a globalized world, that power is more effective than arms in the long run. “We”, meaning the U. S. and the European Union could cripple the Russian economy, but at a cost to ourselves, with Europe bearing much more of that cost. America can only lead as far as the Europeans are willing to follow. I am of the opinion that despite his 40,000 troops on the Ukraine border, Putin does not want to invade eastern Ukraine because if he does who knows what the unintended consequences might be? As is, ingesting a poor Crimean economy into Russia is predicted to be very expensive in itself, and the eastern Ukraine’s economic struggles would figure to be another burden. But Putin acts like he doesn’t care, so Western analysts can only guesstimate just how much of a gambler Putin is and how he defines winning. And what with violent clashes popping up here and there who knows what events on the ground might prompt? In any event, finding an equilibrium between Russia and the West in Ukraine appears to be quite a balancing act and the government in Kiev is walking a shaky line with globalized interests swirling about it. (*1) Receiving more attention are recent reports of the likely use of chlorine gas by the Assad forces, but that is not as deadly nor mentioned in the U. N. chemical disarmament agreement. One more wrinkle in a complex calculation that you can read more about here. (*2) Having said that, I Googled “Russia and Crimea” and found a couple of interesting, though disparate articles. One describes the present chaos in Crimea and the other Putin’s plans to build Crimea’s economy, including a boom in casinos. After posting I checked my link to the Wall Street Journal and found it led to a log-in site (requiring payment no doubt). If you Google “wall street journal ukraine” and scroll down to “Ukraine says military operation in east has begun” you can find the article while avoiding the log-in, at least at the moment. In my prior post I had some fun with the Ukraine turmoil as it was the only way I could get myself to tackle that unfortunate mess at all. However, today is a particularly scary day there, as the possibility of a break out of civil war seems real depending upon how events unfold. One problem is the picture is both murky and volatile, tough to gauge even with frequent reports from news people in the area. 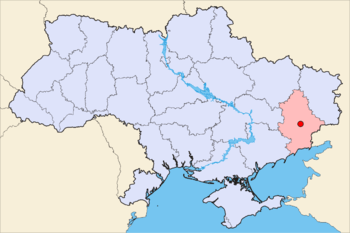 The gist of the situation is that pro-Russian, separatist actions have been taking place in the eastern Ukraine regions of Luhansk and Donetsk in recent days, with various government buildings becoming occupied by apparently well trained uniformed forces without insignia’s similar to those that acted in Crimea. The general opinion outside of Russia is that Russia is instigating these actions. Of course, Russia denies that while Russian TV shows a steady stream of programming blaming the “Nazi led” central government in Kiev for instigating the problems through its actions and lies. The Kiev government has been warning that if the “protestors” don’t give up the buildings, they will use force to remove them, what appeared an empty threat until today when some Ukrainian troops have moved into the region. While Ukraine’s military numbers only a few thousand and are not well armed, they may have more support in those regions than is obvious, as it is an open question as to what the people living there want, even though Russian ethnics make up nearly 40% of their populations. One thing many may well want is more attention than they have been receiving from the weak central government in Kiev. The wild card of note is the force of 40,000 Russian troops camped out just across the border from Luhansk and Donetsk and Putin’s repeated threat to intervene if ethnic Russians are endangered. How might that play out? Of course, there are various diplomatic moves afoot and Putin and Obama talked on the phone yesterday, but nothing seems settled in any way. An indication of the seriousness of the situation can be found in a late addition to this morning’s Washington Post on line, an editorial by James Jeffrey, a former U.S. ambassador to Iraq in the Obama administration and U.S. ambassador to Kuwait from 1996 to 1999. He makes a case for the U. S. sending ground troops to Ukraine. Not enough to challenge Russia, but to show that we will not take another incursion into that country lightly. Also, for those who want to either delve further into this issue or just to keep apprised of unfolding events, check out this Wall Street Journal site. It offers much information and even if it’s too much, you might at least want to scroll down to see a map of those regions indicating where government buildings have been taken over. 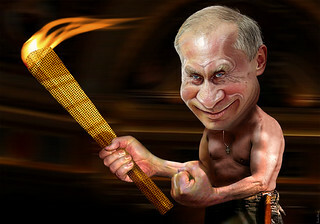 Are Vladimir Putin and Lindsay Lohan an Item? But my point is now the world’s sexiest man (as Henry Kissinger once said: “power is the greatest aphrodisiac”) is free to be a wild, crazy bachelor type and who better to be it with than Lindsay Lohan, for a while at least? I fantasized this possibility when struggling with what to say about the “Ukraine crisis,” which continues to simmer with some 40,000 Russian troops on the Ukrainian border and a few raucous, separatist demonstrations not far from those troops in eastern Ukraine, demonstrations that may well be Russian instigated. Of course the EU and NATO are having meetings to discuss possible greater sanctions if Russian troops do roll into eastern Ukraine, but those nations have varying degrees of dependence on Russian gas and oil, not to mention a multitude of business interests that apply pressure on these governments to maintain the status quo. Because of all that, some have speculated that Putin is gambling that commercial interests in the west carry enough weight to minimize the impact of economic sanctions on Russia, since it will cost them, too. That makes sense to me because I think, above all, Putin loves to be a player. While you can find many analyses indicating that this is a losing strategy over time for Russia, this may be a winning strategy for Putin in the short term. He is less risk averse than are the European friends of the U. S., perhaps because he sees it as his mission to restore the prestige and international position of the motherland, not to reap the maximum economic benefits of globalization. Also, while Russia’s economy is overly dependent on its export of gas and oil, again something that figures to hurt that economy over time, those resources work for it now, given European reliance on that energy and the hunger of China and India to have greater access to it. In that regard, a big energy deal with China is in the offing. And, though this past week the UN easily passed a resolution to continue to treat Crimea as part of Ukraine (1oo votes in favor, 11 against), 58 nations voted to abstain, two of them being China and India. The last-named pair aren’t eager to get on the outs with Russia. They have other shared interests with Putlandia besides energy, such as India’s import of a huge amount of arms, 75% from Russia. Having blurted all that out, you can see why I would hunger for a simple solution to the Ukraine crisis, even if out of left field like my Lindsay Lohan plot. Putin has made a number of clever moves politically in recent months and I think we need something to distract him, and who better to do that than Lindsay. I just checked Google and she says she is still sober, having graduated from treatment for the sixth time last summer. Since she goes through boyfriends faster than a chain smoker turns cigarettes to ash, she might prove an interesting challenge to the Vlad man, and he certainly is a guy who likes a challenge. 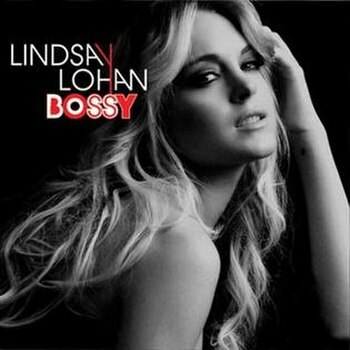 Finally, in case you haven’t been paying attention, Lindsay is not yesterday’s news. Lilo appeared on Letterman last night, looking better than ever I’m told. She is also in a segment of 2 Broke Girls some time this week, and the shows’ two “stars” deny she was a “train wreck” to work with. Just short of World War III, what could garner more pub than America’s never ending troubled teenager hooking up with Russia’s self-styled people’s czar? Put those wedding plans on hold Brangelina. All the hoopla surrounding the relationship might distract Vlado from focusing on expanding Russia for a while. At least it would provide me with a respite from the Kardashians always staring at me in the super market line. P. S. – Those who feel like biting their nails in response to the tensions in eastern Ukraine may want to check out this article in today’s Washington Post. Besides giving a thumb nail sketch of the simmering situation there, it provides a couple of useful maps, including one which breaks down the per cent of Russian ethnics in various parts of southern and eastern Ukraine.